Inspired by midcentury-modern architecture and an easy, breezy, open-air lifestyle, the Axiom Desert House embodies the beauty of prefab living to the core. 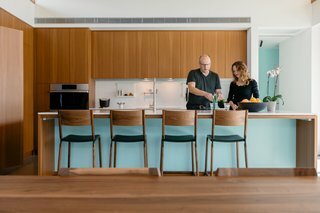 Here, the founders of Turkel Design take us inside their new family abode. To say 2019 has been an exciting year so far for Joel and Meelena Turkel would be an understatement. 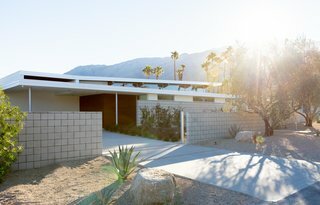 After having spent the last two years working on their own family residence, the couple—founders of Turkel Design—have not only completed the home, but it was also recently a Featured Home at Palm Springs Modernism Week. While paying homage to the area’s legacy of midcentury architecture, it is the property’s modern flair, energy efficiency, and prefabricated structure that makes it so unique. 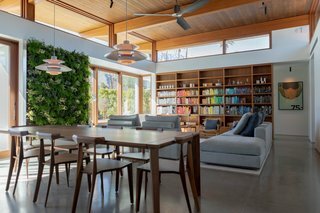 In addition to the Turkel Design signature post-and-beam construction, the Axiom Desert House also features a spacious great room breezing out to a private courtyard. The floor-to-ceiling windows allow the home to effortlessly blend indoor/outdoor living, while infusing the spaces with an abundance of natural light. "When considering the limitations of different prefab solutions, this project wouldn’t have been possible without panelized prefab," explains Joel. "When you panelize and produce componentry, you can virtually create any section and plan as you have a tremendous amount of flexibility," he notes, describing how this option allows for the ideal balance between precision, versatility, and predictability. "With this approach, the only limit is what the clients’ intentions are." "There have been so many cool things we’ve done in this home that we’ve been wanting to do with our clients for a long time, but it’s difficult to sell an idea to someone when you haven’t done it before yourself," explains Joel. "Take for instance the living platform. If you describe the notion of a living platform to a client, they might think you’re a bit off your rocker, but when they see it and they see the kids playing on it and how it interacts between indoor and out, it instantly opens up new possibilities." 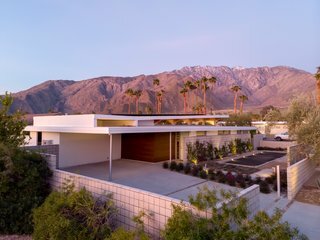 To take advantage of the area’s balmy climate, the couple have designed the 2,110-square-foot house to embrace the indoor/outdoor lifestyle that Palm Springs is so well known for, while enjoying the sprawling San Jacinto mountain range in the distance. One of the ways they’ve fostered this seamless connection is via a "living platform," which features expansive lift-and-slide doors by Marvin. "One of the great things about the Marvin lift-and-slide doors is how they disappear into the pockets," notes Meelena. "It’s not a typical solution, and it offers exactly what we hoped to achieve with this home. We wanted to foster an intimate connection with the outdoors." "The living platform, for me, is my favorite spot in the house and I think it’s probably going to be our family’s favorite spot, too, because it feels so special," states Meelena. "We’ve wanted to include a living platform in one of our projects for well over a decade, but it’s just been a bit of a hard sell for clients. Now, when you see it and you see how the doors just slide into the pockets and it opens up the entire frame of that daybed, I don’t think it’s going to be a hard sell anymore," she jokingly laughs. "I love that our girls have already taken to it, and it makes sense. You’re closer to the sun and fresh air; you’re more central on the site. It just feels right." When it came time to select appliances that would seamlessly blend into their kitchen, Joel and Meelena relied heavily on Dacor for their elegant, high-tech product line. "What I love about the camera in the fridge is that it’s highly functional and not just a gimmick," notes Joel. "How many times have you gone to the store and purchased things because you forgot you had it? In my mind, this is a beautiful, simple feature that allows you to use less and waste less—while also wasting less time." Another space the family looks forward to gathering together in is the kitchen. Strategically designed to have minimum visual clutter, the husband-and-wife team tapped Dacor for tasteful, high-tech appliances that would blend effortlessly into the room’s clean, contemporary aesthetic. "We chose Dacor because the design of the appliances is incredibly sophisticated—both in terms of their functionality and appearance. They are not only beautiful, but powerful and precise, with an intuitive interface," explains Meelena. "Also, most of the cabinetry in our kitchen is push-to-open, so it was wonderful to see that the Dacor refrigerator and freezer have that same feature. It made the integration of the appliances into the design seamless." 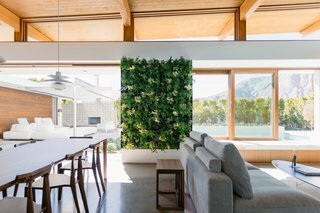 "This is a fairly smart home, so we can control the HVAC system, the lighting, and the security system all from our phones and keypads on the wall," Meelena explains. "We didn’t want to go overboard, but there was a certain amount of technology that was integrated into the overall design." Sustainability was another factor that maintained high priority within the Axiom Desert House. Built from engineered wood, the home doesn’t use any dimensional lumber and the photovoltaic system will completely power it throughout the year. 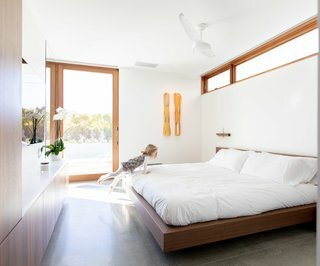 Thanks to the efficiency of the bedroom fans by The Modern Fan Co., the Turkels can keep the Marvin lift-and-slide doors open throughout much of the year without having to rely on air conditioning. "We want to be able to keep the doors open as much as possible, yet sometimes the air movement in the desert isn’t sufficient to counteract the heat, so the fans are really a must," adds Meelena. Additionally, sleek bedroom ceiling fans by The Modern Fan Co. will assist in cooling the residence from the desert heat, allowing the family to keep the doors and windows open while reducing the need for air conditioning. "The fans in the house are all about trying to eliminate the energy usage, and just like with the appliances, we really wanted them to be whisper-quiet so Modern Fan was a natural fit for us," notes Joel. A peek of the Axiom Desert House from the exterior, with the beautiful San Jacinto mountain range in the distance. Reflecting on all the hard work that has gone into making the Axiom Desert House a reality over the last two years, Meelena concludes: "Joel and I have worked together for a long time, and have worked on a lot of incredible houses for clients—it’s just so special that this one is going to be home." Read more about the kitchen here!